At Oxford Health, we want to help break the silence and end the stigma around mental health, and support our staff in seeking the help they need. One in four of us will be experiencing a mental health problem at any one time. Nine in ten people who have experienced a mental health problem have faced negative treatment from others as a result. 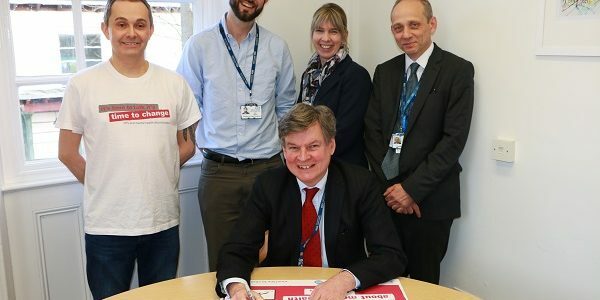 That’s why today we have signed the Time to Change Employer Pledge (pictured in main image is our Chief Executive Stuart Bell, signing the pledge). Vanessa Odlin (pictured below, on right), Head of Oxfordshire Adult Mental Health Services, said: “The pledge is recognition of the fact that we not only need to look after and care for our patients but our staff as well. To enable this, we will be recruiting Time To Change Champions to support our staff’s mental health, create opportunities for staff to discuss their mental health issues and make such discussions part of our working culture. We will also shortly be organising a ‘Time to Talk’ event, and we will encourage attendees to carry on the conversation about supporting staff mental health in their own teams. Keep your eyes peeled for more personal stories from our staff members, as we share blog posts and videos about staff members’ personal experiences of dealing with stress, low mood and other mental health issues at work. 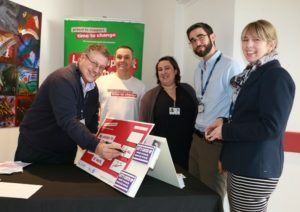 Vanessa said: “We hope our Action Plan supports us to promote a culture of openness and that this will help combat discrimination towards people who experience mental health problems within both our staff and patient group.